You think you’re fine; you’ve done this before. No obvious nerves or jitters. I mean, we’re all just riding for fun, right? This year, as many of you already know, Cory, Stephen and I each won a place to participate in this years’ Brompton World Championship (“BWC”) in London via the general ballot entry drawn back in February. As London is quite a way to travel for a 30min race, we extended our stay for just over a week which allowed us to meet and ride with other Bromptoneers from all over the world, tour the Brompton Factory, test ride the demo Brompton Electrics at Brompton Junction and participate in the Ride London events, culminating in the BWC on the evening of Saturday, 28 July. “I was just talking to my daughter who lives in London. She’s keen to catch up for a ride. They have Bromptons,” was the message I received from a friend back home. I didn’t reply, ‘You had me at “Brompton”,’ but it would have been true. Amy and Phillip who showed us the way to Regent’s Park, Primrose Hill, and Hampstead Heath – much further than we would have ventured by ourselves. Two days later, Glenys (an ex-Melburnian) and Lynn took us for a ride to Greenwich. We might have found our own way there, but we wouldn’t have had the privilege of a running commentary of historical facts and local knowledge on what we were seeing along the meandering and aptly-named Quietways 1 (“Q1”) route. You just can’t beat a local guide! A drink turned into dinner – when you’re with friends anything goes! Crossing the River Thames – at least it was cool down here! Following cycle superhighway 3 (CS3) for a short while – these are great! Speaking of local, we couldn’t pass up the opportunity to ride with the London Brompton Club (“LBC”)! Held on the evening before the BWC, the ride coincided with a break in the weather. Our first week was stinking hot and humid despite being only in the low 30’s. But right on queue for the LBC ride came a thunderstorm and a very welcome cool change! The soggy (but cheerful) ride concluded at Brompton Junction for Bollinger Champagne (now I know why people rave about it ! The benefits of a corporate collaboration, hey?! ), nibbles, and making more new friends. Bromptons might blend in here, but Aussies still manage to stick out! Bollinger champagne. Now I know what the fuss is about! Somehow we all managed to fit inside Brompton Junction. A glass of Bollinger (or two) helped the evening flow very nicely! Sunday (post-BWC) was the Brompton Society ride, organised by Valeria Lopes, of Valeria’s Bike Accessories. Heading out despite the rain, our group decided to let Brian Jones lead us on a ride to Greenwich – on an almost completely different route to the ride we did with Glenys and Lynn just a few days prior. We crossed over and under the Thames, rode around Olympic Park and Victoria Park, stopped at London Bike Kitchen in Hackney, and did more Brompton Mafia lifts than most of us could have imagined – thanks Ryan! Brompton lift on the Tower Bridge. Timing is everything here! The common bond shared by Brompton owners means it doesn’t matter where your travels take you, it doesn’t matter if you have joined a Brompton club or not. You own a Brompton? Welcome to the fold. Besides simply enjoying riding, exploring and making new friends with our Bromptons, we also did a tour of the Brompton factory. Stephen and I last did the tour in 2016, shortly after Brompton moved into the Greenford factory. Two years on, the factory floor is full, painting is now in-house, there is a separate assembly area for Brompton Electrics, and it’s full steam ahead! The two main questions that everyone wants to know about the Brompton Electric (“BE”) are a) is it any good? and b) when will they be available in Australia? The answer to the first is YES. Initially only produced as M2L and M6L, a H bar option is now rolling off the production line. The steering is slightly dampened by the motor in the front hub, but to be honest, it felt just as responsive as riding my Brompton fitted with Marathon Plus tyres. The BE will only assist you to 25kph (as required by Pedalec legislation, as adopted in Australia), but the biggest difference it would make on my commute is that hill just before I get to work wouldn’t draw a sweat anymore. As for when they will be available in Australia… we don’t have a definite date, but we will let you know as soon as we do. BE’s are being rolled out to customers in the UK first, then Europe, then the rest of the world. Selecting appropriate attire for a BWC is very important. Naturally you want to be comfortable, but some people try to make a loud statement, whereas others simply look dashing, dapper, chic, or like they’re having too much fun to care what anyone thinks! Most importantly, no one is wearing (visible) lycra. The men wear shirts, jackets and ties, and the women dress in a similarly appropriate ‘business style’ outfit. In Brompton’s official hospitality area, where the riders and their guests meet and greet before the race, eyebrows are raised over some modifications and envious glances are cast at other ones, costumes are applauded, hands are shaken and many, many photos are taken. There are a couple of stalls to browse, food and drink (riders received a complimentary food and drink pass, but it couldn’t get you alcohol until after the race) and ‘Wheel of Fortune’-type prizes to be won. This is the most amazing factory reject I’ve ever seen! The benefits of working for Brompton, hey? The day was fine, but windy. The long spell of hot, dry weather in the lead-up to this event meant there was a lot of dust, dirt and leaves blowing gustily down The Mall. We’d be riding right into that soon enough. Hope everyone brought eye protection! 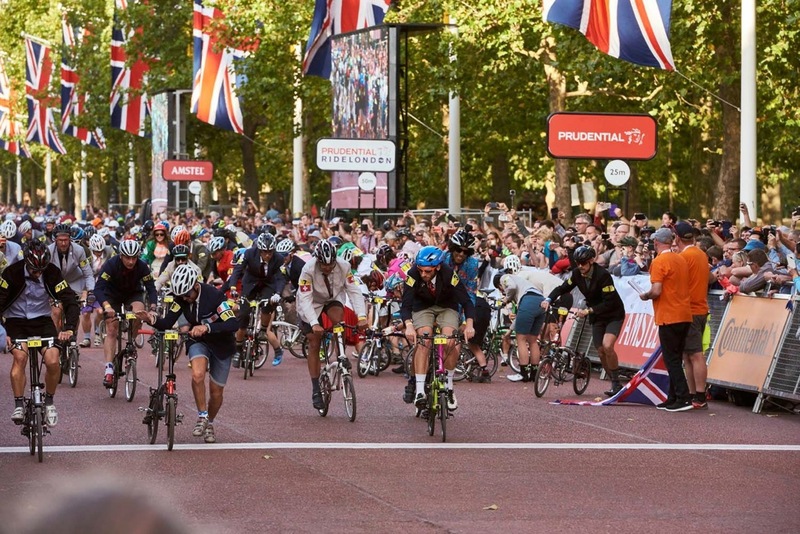 With the women’s Prudential RideLondon Classique (an elite, Union Cycliste Internationale “UCI” category race) having warmed up the crowd for us, we moved out and found our assigned place on The Mall. You think you’re fine; you’ve done this before. No obvious nerves or jitters. I mean, we’re all – all 550-odd of us – just riding for fun, right? But then, “…Three! Two! One!” The claxon sounds, and your pulse jumps as the first wave of riders dash across the track to unfold their Brompton. If that wasn’t the signal for your group to run, unfold and start racing, then you have to wait another 10sec (group B), or another (group C), or even another (group D)! Don’t fluff the unfold. Quick is one thing, but if you’re already up to 40sec behind, what’s another second to make sure you’re at least riding in comfort for the next 25-30min? Get yourself clear of those still unfolding. Overtake on the right, move to the left if you’re not passing. Find someone slightly faster than you to draft behind. When you hear a buzz approaching from behind, like a swarm of bees without the high-pitched whine, that’s the leaders pack about to overtake; hold your line around corners and keep left! How many laps of St James’ Park you ride is up to you; but pace yourself so you don’t flag before the end. It’s easy to lose count of how many laps you’ve done; is this number five or six? When the bell finally rings signalling the last lap, you realise there’s still one more lap to go! Better make it a good one! The race finishes after the leading group completes 8 laps; everyone else completes the lap they’re on before exiting the course. And then you can relax because it’s over… only you can’t because you’re grinning from ear to ear and you know you’ll be buzzing from the adrenalin for a few hours yet! Despite the headwind, and despite starting down the back of the field, I managed to squeeze in one more lap than I managed two years ago. Stephen, Cory and I each achieved 7 laps of the park – a pretty good effort all round! After a very welcome and most refreshing post-race G&T came the winners presentations and a short speech by Brompton CEO, Will Butler-Adams – a wonderful conclusion to another fun-filled day celebrating our mutual love of Bromptons. And they call these cobbles! Checking out the BWC route. Won’t be any photos during the race! The talent required to make this plaque is astonishing! Some of Brompton Bec’s handiwork – very impressive! Another Aussie! Very impressive waistcoat! Caught up with Stephen Loftus, too! Note the badge! This year’s winners – Cam Gutteridge and Emma Pooley! Careful horse – that’s my Brompton! This entry was posted in Member Stories and tagged #MadeForRacing, Brompton World Championship, Brompton World Championship Final 2018, BWCFinal2018, Melbourne Brompton Club. Bookmark the permalink. Great story Dayna and congrats to you all on 7 laps. 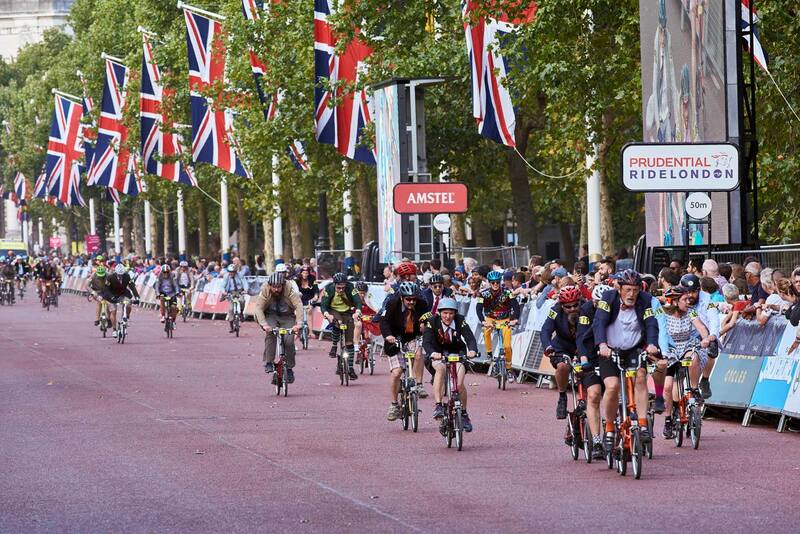 I have watched YouTube (Orange Brompton, Graham Williams) of the ride to Greenwich and reckon it must be a blast. So much history and even through the tunnel under the Thames. SO much history to discover – even a week there barely scratches the surface of the amazing places there are to find and learn about. I’ve linked your blog post there too. What a lovely write up you’ve penned for The Clare Champion. Thank you also for the ping-back. I’m glad you weren’t racing with a bad back this year; the wind was definitely enough to deal with! Good luck with your ballot entry for next year. Being just a little further away we might stick to trying for once every second year. Do say Hi if you’re ever down this way! Seven laps was a great result. I need to pick up my pace. It’s my goal for next year. April club ride options - have your say!